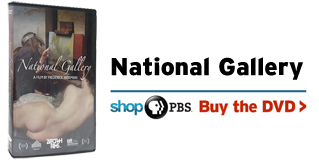 Watch NATIONAL GALLERY excerpts, and read some of Wiseman's thoughts about the process of making a documentary film. "I am trying to make films about as many different aspects of contemporary life as possible. Every film is like a trip to Las Vegas. I roll the dice with the choice of subject matter and hope that I find enough interesting sequences out of which I can make a film.​"
Courtesy of Zipporah Films Inc.
"I thought of making a film about a museum at least 30 years ago." "It was fascinating to not only have the chance to film paintings from one of the world's great collections but also to have the opportunity to film aspects of the work involved in the study, restoration, exhibition, and public education related to the National Gallery's superb collection.​"
"I was not particularly interested in the power and political struggles among the staff at the National Gallery. All the major human experiences - birth, death, war, cruelty, kindness, love, ambition, greed, lust, tenderness, and banality - are present in the paintings.​"
"I don't like to read novels where the novelist tells me what to think about the situation and the characters. I prefer to figure it out for myself." "The ratio of film shot to film used varies between 40 and 60 to 1. Depending on the length of the final film, I use 2 or 3% of the material shot." "The question of how to film a painting is fascinating. I thought the best way was, when possible, to remain inside the frame of the painting. The painting can fill the screen and the viewer is not distracted by other paintings, the plaque with the name of the artist, the frame or the wall. I think the world of the painting is more present when shot in this manner. The painting becomes less of an object and the viewer can more easily enter its world.​"
"In an abstract way the film tries to compare different ways of telling a story. Every form, whether it be a painting, movie, dance, play, poem, or novel, is different. The abstract issues – characterization, passage of time, creation of metaphor – are the same. NATIONAL GALLERY, in an abstract way, tries to suggest how these common issues are dealt with in different forms, particularly in film." "There is a big difference in the way my documentaries are made compared to a fiction film. Generally a fiction film is made from a script which is written in advance and then filmed. My process is the reverse. When I start I have no idea of the themes or point of view. I take the gamble that over time I will collect enough sequences out of which I can make a film. I discover the film in the editing."